So I was so happy the other day when I noticed that my three little Viola plants were covered in blooms. I knew I just had to bake something so that I could use the flowers to decorate! Whilst I was waiting for the flour to grind I decided on some simple chocolate cupcakes. I bake with a lot of organic and natural ingredients. White sugar and it's processed relations are banned in my kitchen, so it can be tricky finding ways to make my sweets look pretty. Using fresh flowers are the perfect solution and add a touch of novelty too! I'm now planning on expanding my Viola plants into a bed, and perhaps I will add some other varieties too. Pick your flowers once you're ready to serve, otherwise they might wilt if you decorate ahead of time. Don't wash your flowers if using something as delicate as a Viola, as you could damage the leaves. Simple carefully look them over for any spots of dirt or tiny bugs. Only use flowers that you have organically grown yourself. Don't use the flowers off plants you purchased at a nursery as they could have been sprayed or fertilised with artificial chemicals. Flowers are beautiful and you want them to be the centrepiece of your deocrating! Use simple methods of decorating to allow your flowers to shine. For my cupcakes I simply whipped some pure cream, dolloped it onto the cupcakes and then placed two or three Violas in the centre of the cream. Different flowers have different flavours. 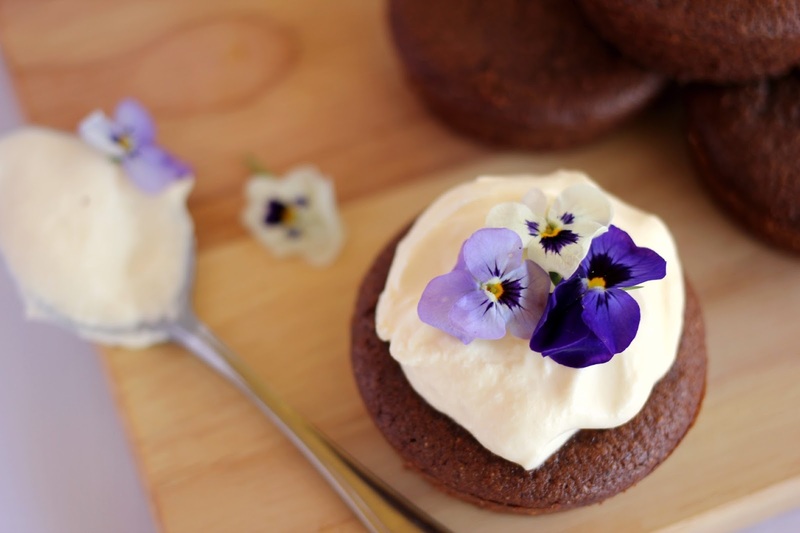 I found Violas perfect for sweet cooking with their vanilla-like flavour. Something a bit spicy like a Nasturtium is more suited to savoury food. 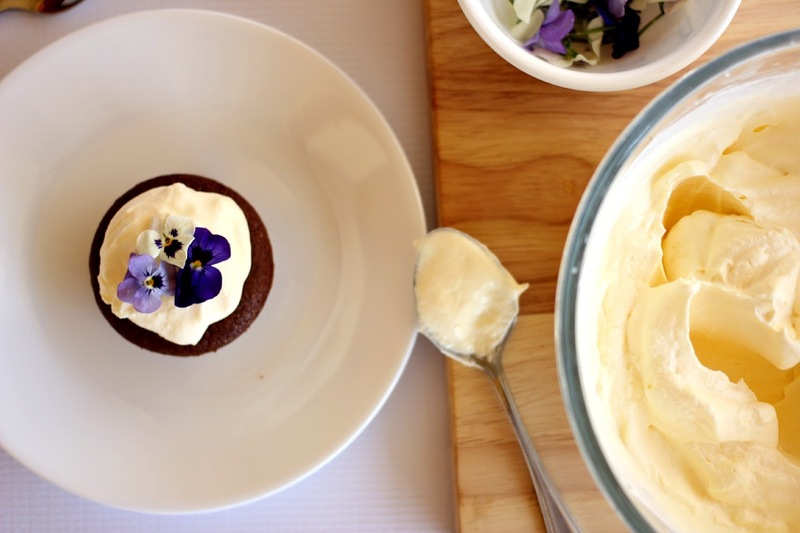 If you have any tips for working with fresh flowers in either sweet or savoury cooking, I'd love it if you'd share them in the comments below! This is absolutely beautiful! 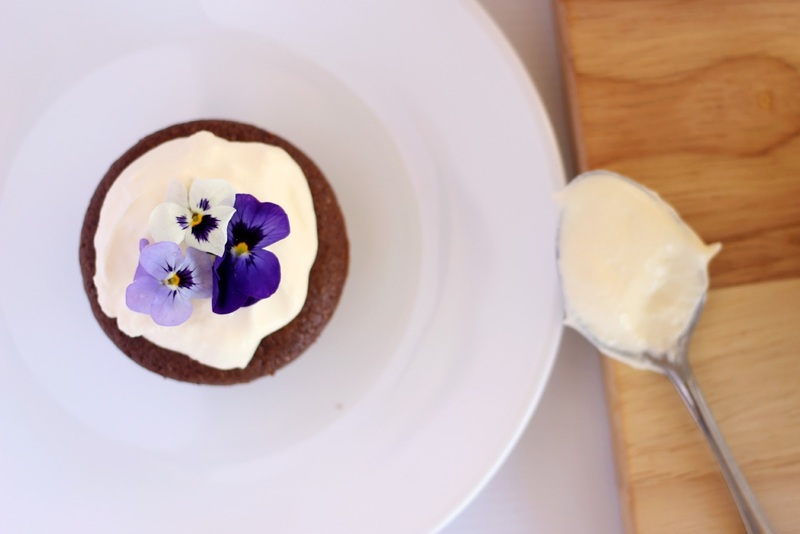 I'm pretty into edible flowers too. I have nasturtiums which I use in salads and as cupcake toppers, I think I need to plant some viola now.